Welcome to our page representing the top living room paint ideas for 2018. Deep, rich, hushed, and private. These four words describe the color forecast for 2018. We are seeing major trends in making our homes feel safe, warm, and private and the color trends reflect that now more than ever. The tones are darker, moodier, even the lighter tones are more muted. A lot of the colors are inspired by nature and our desire to break away from busy, complicated lives. Our homes are our nests, our places of sanctuary and comfort, and the 2018 palette will help us to create the perfect retreat. For an earthy, organic tone, consider Behr’s Unplugged for your living room walls. This olive-brown is a great dark neutral to pair with muted light colors, mossy greens, or bright blues. Olive-brown walls are the perfect backdrop for a teal sofa and almond-colored chairs. You can also use Olive-brown as an accent color with another 2018 color trend, Millennial Pink. Paint your walls Millennial Pink and paint your wood furniture olive-brown. Add mocha and magenta accessories for a young Tokyo vibe. If you want to keep the earthy feel, accessorize with mossy green, cappuccino, and plenty of live plants and natural materials. Seek out a modern raw wood and glass coffee table and pair it with a faded and worn vintage wool rug layered over a woven seagrass rug. The green tone of the seagrass will bring out the olive tones in the brown and help highlight the mossy tones in your accessories. As will most dark colors, you want to keep your room from being too cluttered, keep furnishings simple and don’t overload the room like a Victorian Parlor. Another huge color for 2018, so big that it is being called “the new black” is Black Flame by PPG Paints. An intense and moody navy-hued charcoal that is sure to turn heads, this is the IT color for your living room walls. This color creates a dramatic backdrop that allows you to show off your items in style. If you have one amazing piece of art, create a gallery-style focal wall with black flame and showcase your art. Because Black Flame brings a sense of modernity, even painting one wall will update a space dramatically. If you are a fan of pastels and gold-toned metals, but feel the palette reads too light or juvenile, give your living room walls a coat of Black Flame. Your updated look will feel elegant, luxurious, and decidedly grown-up. Your mid-century Teak furnishings are a natural match for Black Flame. Layer in plenty of texture with chunky throws, linen draperies, house plants, and fun accessories to keep this look warm and comforting. Everything from pale pink to bold mustard yellow goes well with this sophisticated and dark neutral, so don’t be afraid to update an existing look just by changing your wall color to Black Flame. Sherwin Williams has named Oceanside as its color of the year for 2018, and with good reason. A bold but not overly bright blue with green, resulting in a jewel-toned stunner of a color. Versatile, full of dimension, and reminiscent of mermaids and the deep blue sea, this color is perfect for those of us with a bit of wanderlust. This blue-green gemstone of tone goes so well with wood that it is hard to believe that anyone would chose anything else! Whether you have traditional walnut or modern beech furnishings, Oceanside will look bright and cheery, you just can’t muddy it up! This color plays well with just about every other color out there, but it really shines when you use other blues and peacock-green tones with it. A blue sofa, peacock and black and white throw pillows, a light leather ottoman, and a bright white upholstered chair on top of a black and white geometric rug make for a casual, comfortable, welcoming space. What is really cool about this color is that it plays well with light. Different light sources will bring out the light and dark tones, the blues and greens, giving your walls a dimensional feel. And because of it draws inspiration from nature, you can be that coral will be a great match for this nuanced hue. Caliente!  This bold, spicy brick red from Benjamin Moore is at the top of the list for 2018 as well. It is more deep than bright, more refined and elegant than a true, cherry red. Like most of the top Living Room colors for 2018, this is no shrinking violet, this is a wall that wants to be seen. So, what looks good with this bold red? Inspirations from nature, think pink and red sunsets, the color of a golden retriever, tones of stone grey, and natural wood browns. This color goes across a range of styles, from rustic to modern, you can cover just about any style with spicy red. Brass and bronze sparkle and shine and pick up warmer tones when paired with this cozy color. A modern, caramel-colored leather sofa atop a lattice-patterned flokati rug and accented with an Eames-style lounge and ottoman, a brass-framed side table, and natural wood and glass Noguchi-inspired coffee table backed by Caliente walls make for an energizing retreat after a draining day at work. 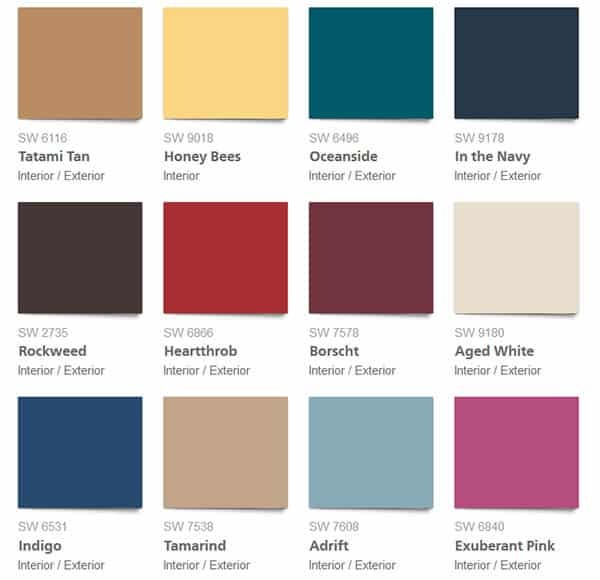 Visit Sherwin Williams to see their picks for paint color of the year for 2018. Visit Behr paint to see their top picks for 2018 paint color trends. Whether you paint an accent wall or your whole room, 2018’s darker, richer palette is sure to be a game-changer for your space. From spiced red, to mushroom brown, to the teal of a Peacock’s feather, fill your home with lush, deep hues that bring a sense of warmth and comfort to your home. Most of these colors can be utilized as dark neutrals, meaning that you don’t have to change everything you own in order to update your living room. These gorgeous colors add a modern vibe to transitional spaces and lend an understated elegance to more modern designs. Regardless of your aesthetic, you can easily work these colors into your living room design and have confidence that they will look amazing for many years to come.